Swedish brand Saab seems to have a future again, courtesy of Dutch sports car maker Spyker, which has agreed to buy the firm from current parent General Motors after some protracted boardroom bean counting. What are the flatlanders getting for their money? We thought we would get a taste by taking a 9-3 EcoPower Turbo Edition saloon for a spin. The first thing that strikes us, even before we’ve turned a wheel, is that Saab’s legendary quirkiness begins when you pick up the key. The object handed to us when we collected the car didn’t look like a key, it looked like a rubber bottle-opener. The usual serrated metal strip that most keys depend upon to unlock things is hidden away, like a skeleton in a closet, slotted inside this bizarre black object with its central locking buttons . You can tug the metal part free if you need to unlock a door in an emergency, but normal car-starting duties are done by inserting the blunt nose of the rubber bottle-opener into the ignition slot. Which is down beside the handbrake, obviously. Once on the go, though, things feel less overtly odd. 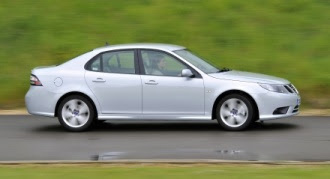 Saab is famous for turbocharged road cars, and there is no mistaking the source of the EcoPower’s ample 180bhp. Power builds markedly with revs, from what feels like quite a low starting point. As a result, overtaking urge can sometimes arrive not quite on cue. You quickly get used to the pause before the punch, though. Once on boost, this is a very rapid car. So that’s the Power part – what about the Eco? The engine is a 1.9-litre TTiD - a four-cylinder, twin-turbo diesel, which bestows on the 9-3 a combined-cycle score of 139g/km and 53.3mpg. While not the brightest shade of green on the chart, this is not a bad result for a medium-sized saloon with sporting aspirations. The engine sounds are unmistakeably diesel, particularly on startup, and with 400Nm on tap the car feels like a diesel too. Actually, it feels most persuasively and unmistakeably like a diesel when you floor the throttle at 50 in fifth, and the roof panel hums and vibrates in tune with the engine as it shudders like a Routemaster bus. Treat the engine with more compassion, though, and its better side shines through. We found the car very driveable and even a little chuckable. Despite all that torque we never felt any torque steer, and you can hustle along quite quickly on B-roads. The steering is just about up to the job in terms of feel and feedback, while the brakes are slightly more communicative and very effective. You won’t mistake it for a BMW, but equally it feels a very large cut above the Vauxhall Vectra on which it was based. We aren’t especially keen on the car’s looks – the fussy nose seems (and is) grafted on, failing to match the unadorned slab sides. 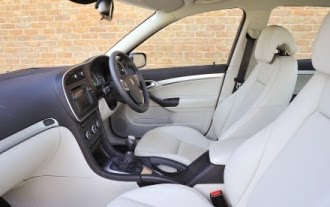 And inside it’s an equally unsorted bag – great visibility, lovely leather seats, quality materials, questionable design and very dodgy details. The dash looks dated, the fussy handbrake is ill-conceived, the gearbox has a throw like a rowing boat, and the control stalks seem to have been made from the same type of plastic used to form the trays for microwave meals. Despite the above, we couldn’t help liking the car quite a lot. You can buy a brand new 9-3 EcoPower Turbo Edition from £18,995 – take along your haggling hat and you can probably lop off a fair few quid, given the marque’s current precarious position. The approved used sticker prices are laughable, and you won’t find many private sellers, but again, haggle hard and there will be distinct bargains to be had. You will need to drive it till it falls apart, mind. The terms "residual value" and "Saab" can only hang together in a sentence when accompanied by adjectives like terrible, awful, or dismal. Whatever happens to Saab going forward, new broom Spyker is not going to sweep away that issue in the foreseeable future.